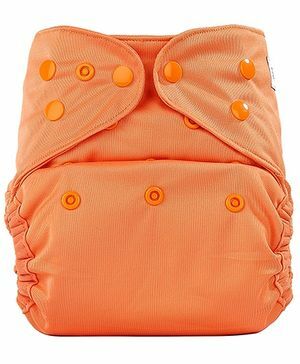 Bumberry reusable one-size cover diaper with 1 sensitive low absorbency bamboo insert for babies with sensitive skin for ages 3 Months to 3 Years. One Size Reusable Diaper Cover (Adjusts SMALL-MEDIUM-LARGE in the same diaper) with One Natural Bamboo insert, Change only the pad every 2-5 hrs depending on the urination pattern and keep the same Diaper Cover for a second use for the day, after wiping the inner portion. If we buy it for new born, this will last till the baby crosses 3 years of age. Preferred by mothers mostly as an excellent day time diapering option for babies under 1 year. More mothers prefer to use a Bumberry Diaper Cover with natural Bamboo Insert as a solution for high skin sensitivity and allergic to disposables. The Bumberry Wet free Microfiber Insert is also an excellent option with the Bumberry diaper cover as the insert has a wet-free suede micro fleece fabric on the skin facing side of the insert that keeps the baby bottom dry. Please check out for Bumberry Pocket Style Diaper as an excellent overnight diapering solution and any-time diapering solution for babies over one year of age. Snaps closures, with hi-tech waterproof fabrics that keep leaks at bay. Bio-Soft liners make diaper changes a breeze. Count the 3000 disposable diapers used by one baby on average adding to upto 1 to 2 TONS of garbage. It is estimated that one single-use diaper can take 500 years to biodegrade. Bumberry confines to the world's motto of "Reduce, Re-use and Recycle." There's nothing like the feel of soft cloth against your baby's skin. You can tell when cloth is wet, so cloth diapers get changed more often and that's healthy. Babies in cloth benefit from more air circulation, less build-up of high temperatures, and are less susceptible to skin rashes unlike in disposables. Research reports 1 find that the composition of baby's excreta was only 18% faeces (solids) and 82 per cent urine on average during the first two and half years of age. Solids will easily come off the fleece. Bleach is not recommended because this will damage the lamination of the diaper. Fabric softener is not recommended because this will clog the pores of the fleece and insert fabric. getting bumberry diaper cover the second time. its 100% worth the money. one time investment for 3 years. it is ok. bt not running more than 2 hrs. it gets wet both cover insert. no use of cover poop always gets on both. insert not fitting to the cover. liking the pocket diaper of bumbery. i dont like cover with insert its made of polyester nylon. I am disappointed with the quality of the diaper. There seems to be leak due to which the diaper gets wet from outside resulting in wetting of the bed. Such bad quality diaper should not be delivered to customers. I doubt the quality of products you guys deliver. its good for the day diaper I use it with one insert for 3-4 hrs in a day and its fine.. never tried for.night as my lil one wets every 15 mins so I feel disposal is good for night time..
Good product if we use other insert of 4or 5 layer it will be such an amazing product..
Good fitting due to adjustable size. N worth the money put in.